First edition of this collection of essays written in Angelou’s inimitable style. Octavo, original half cloth. Signed by the author on the half-title page, “Joy Maya Angelou.” Fine in a fine dust jacket. Jacket design by Catherine Casalino. 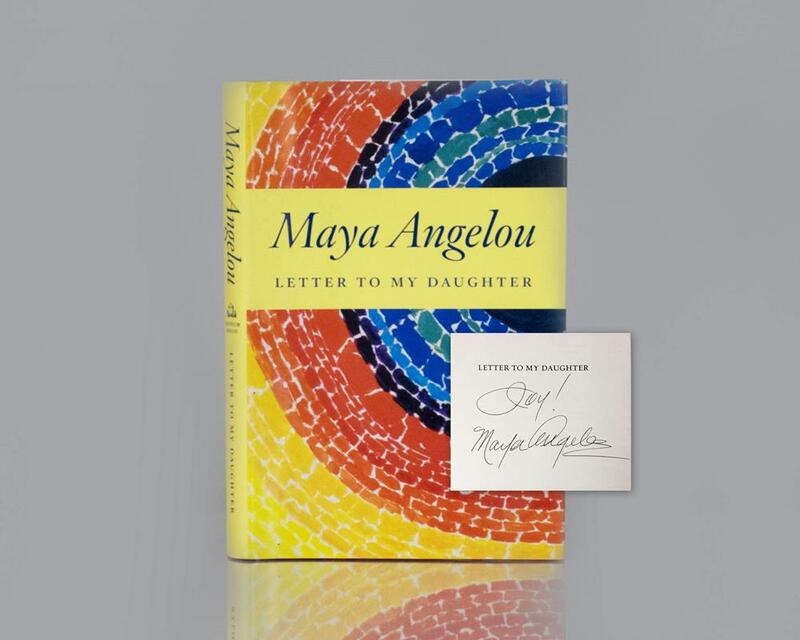 Dedicated to the daughter she never had but sees all around her, Letter to My Daughter reveals Maya Angelous path to living well and living a life with meaning. Told in her own inimitable style, transcends genres and categories: guidebook, memoir, poetry, and pure delight. First edition of Angelou’s critically acclaimed first book. Octavo, original first issue book, with the top edge stained red. From the library of writer and close friend of Angelou’s James Baldwin’s library with his signature to the front free endpaper. Signed by the author, “Joy! Maya Angelou” on the half-title page. After Angelou’s close friend Dr. Martin Luther King Jr. had been assassinated in 1968 depression had set in. Her dear friend James Baldwin, or Jimmy and her “brother friend” as she affectionately called him, took her to a dinner party to brighten her spirits, if only for the night. The party was at the home of the Pulitzer prize-winning cartoonist Jules Feiffer and his wife Judy in late 1968. Everyone in the room began sharing stories about their childhoods, but when it was Angelou’s turn to speak, Mrs. Feiffer was blown away by her storytelling. The next day Feiffer called Random House editor Robert Loomis to tell him he should have Angelou write a book. Following Mrs. Feiffer’s orders, Loomis asked Angelou to write a book about her life, but she said no. Angelou considered herself a poet and playwright, not an author. He asked again; she declined again. Around the fourth time he changed his tune. She had just written a TV series and was out in California when he called. “It’s just as well you don’t attempt to write autobiography, because to write autobiography as literature is almost impossible,” she remembers him saying. “Maybe I’ll try it,” she replied. Loomis’s new tactic had been inspired by a conversation with Baldwin. Baldwin told Loomis that in order to get Angelou to do anything, you have to tell her she can’t do it. The reverse psychology worked. She isolated herself in London and began writing I Know Why the Caged Bird Sings (1969), the first of her seven book autobiography series. It was instantly a bestseller and is her most critically acclaimed work. Had it not been for Baldwin and Angelou’s pugnacious tenacity, the world may have never known she was a masterful memoirist. Near fine in a near fine dust jacket with light rubbing. Jacket design by Janet Halverson. An extraordinary association copy linking two of the greatest African American writers of the twentieth century. First edition of the final volume in Angelou’s autobiography series. Octavo, original half cloth. Presentation copy, inscribed by the author on the half-title page, “Ann Sherry, Joy! from Wendy and Maya Angelou.” Fine in a fine dust jacket. Jacket design by Andy Carpenter. Jacket photograph by Dwight Carter. New York: Modern Library, 2004. Early printing of The Modern Library edition of Angelou’s classic memoirs. Octavo, original gray cloth, illustrated endpapers. Inscribed by Maya Angelou on the half-title page. Fine in a near fine dust jacket. Jacket design by Gabrielle Bordwin. This work contains I Know Why the Caged Bird Sings, Gather Together in My Name, Singin’ and Swingin’ and Gettin’ Merry Like Christmas, The Heart of a Woman, All God’s Children Need Traveling Shoes, and A Song Flung Up to Heaven. 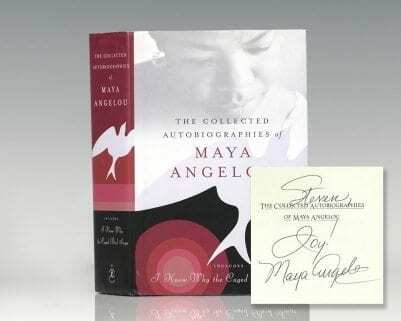 First edition of Angelou’s critically acclaimed first book. Octavo, original first issue book, with the top edge stained red. Signed by the author, “Joy! Maya Angelou” on the half-title page. Fine in a fine dust jacket. Jacket design by Janet Halverson. A superior example.